Here at Fairways Kitchen at Stonelees Golf Club, we look forward to welcoming you to our exciting events. Whether that is one of our tasty carveries or one of our fun quizzes, all the details that you need will be shown here. 2 main course meals for £10!! our curry night is always very popular, we offer a variety of curries from mild to hot. The Fairways Kitchen carvery takes place at Stonelees Golf Club on the second Sunday of each and every month and is held in our Saxon Suite. 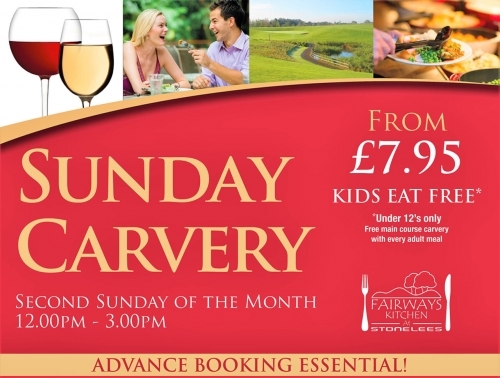 The Fairways Kitchen carvery takes place at Stonelees Golf Club on the second Sunday of each and every month and takes place in our upstairs Saxon Suite. Our extremely popular quiz night is back with a Chinese theme. £7.95 per person tables of up to 8 people.